When I was a kid, you couldn’t pay me to drink a root beer. Something about the smell, which seemed to have a lot in common with the spoons of sticky medicine my mom tried to shove down my throat when I was sick. When I finally worked up the courage to try one (I think it was an IBC), I couldn’t for the life of me figure out what took me so long. All those years of choosing Sprite over root beer: a youth wasted. I took a similar closed-minded approach to the Michelada, that blend of hot sauce, tomato juice and beer. To be fair, putting all those words together sounds like a gross mistake, so it took me a while to come around to it. But just like with root beer, my eyes have been opened and I don’t know what took me so long. Years wasted. 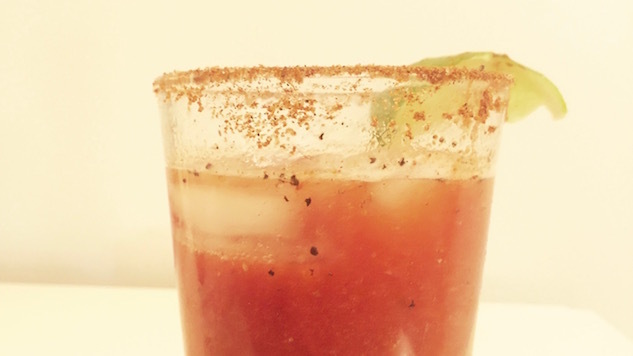 Consider the Michelada the more refreshing cousin to the Bloody Mary. You get all of the spicy, savory notes that have you reaching for a Bloody Mary in the first place, but in a lighter, less boozy concoction. Each cocktail only uses half a beer, and that beer cuts the soupiness of tomato juice and gives it a bubbly kick. And sometimes you don’t want a lot of booze in your drink. Like at breakfast. On a Wednesday. Traditionally, the Michelada is made with an easy-drinking lager, which plays the mellow straight man to the rest of the wild ingredients in the cocktail. And it’s a good way to dress up a crappy macro lager. But listen, the beautiful thing about a Michelada, is that it begs for experimentation. Not only can you interchange the juice (clamato or tomato?) and the spices and hot sauce, but you can get jiggy with the beer too. Lagers are great, but an IPA can add a fruity component to the cocktail. Play with the beer selection, and you can bring out new dimensions to this refreshing cocktail. Here are four variations on the Michelada for you to try at home. Even with the original Michelada, there’s room for interpretation. Some things are a must (lime juice, hot sauce), but I like to add a briny element with olive juice, and take the acidity off of the tomato juice with a couple of pinches of brown sugar. Start with this recipe, but then get creative. Directions: Rub a lime wedge around the rim of a pint glass and salt the rim with Tajin seasoning. Add all ingredients (except the beer) to the glass. Add ice, then top with beer. Stir and garnish with a lime wedge. You’re going to take a similar approach to the traditional Michelada, but your beer is going to be Stone Brewing Co.’s Smoked Porter with Chipotle Peppers, or something similar. It’ll add a smoky, roasted character to the cocktail, which actually plays well with the tomato juice and hot sauce. Add a couple of extra dashes of brown sugar to play up the sweetness of the chipotle, and make sure you use a chipotle based hot sauce, like Cholula Chili Chipotle. Directions: Rim the glass with lime and Tajin seasoning. Build the cocktail in the glass, add ice and stir. Garnish with a crisp piece of bacon. Give that Radler or Shandy a twist by using it as the base for a Cuban Chelada, which eschews the tomato juice altogether and focuses on adding citrus and heat to the base beer. This is also a good version for those of you who are skeptical about adding tomato juice and beer. Directions: Season the rim with lime and Tajin. Add the juice of a lemon, and hot sauce to the bottom of a pint glass. Pour in beer. No ice needed. This might be the most refreshing of the bunch. Much like a lager, the light, crisp wheat beer serves as a backdrop for the rest of the ingredients in the cocktail. But it also provides a refreshing, super-carbonated element, and the lemon and lime play well with the wheat, too. Oh, and we’re ditching the tomato juice for orange juice in this one. The result is something similar to a Mimosa. Directions: Season the rim of the glass with lime and salt. Add all ingredients to the glass. Add ice and stir.